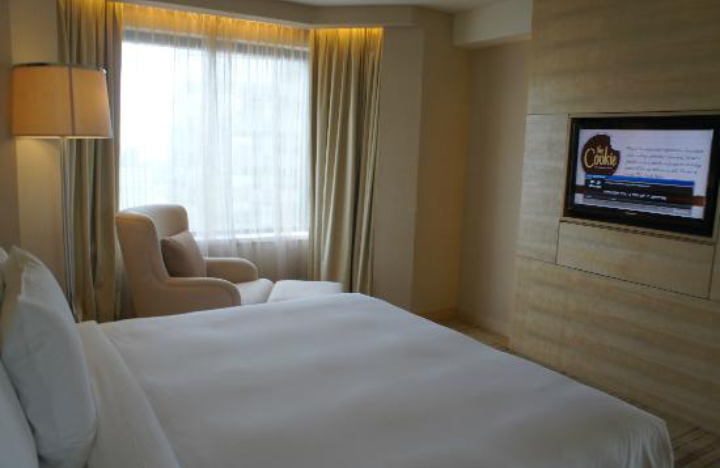 DoubleTree by Hilton is located at the outskirts of Kuala Lumpur City. 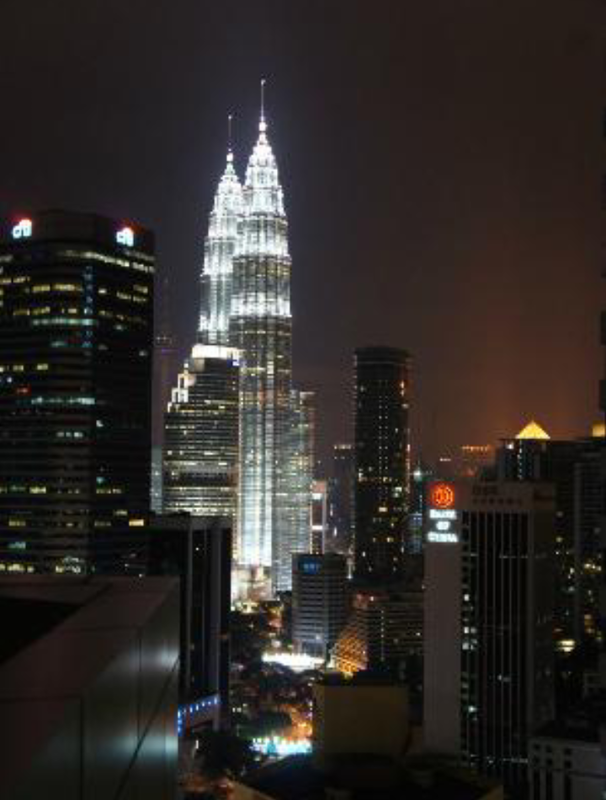 It is about 20 mins walk from KLCC and the Petronas Twin Tower. 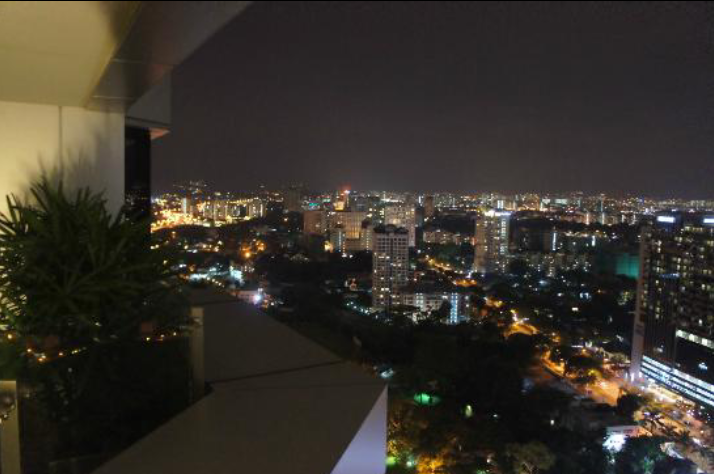 The hotel is rather far from everything else, however the hotel does provide shuttle service to KLCC , Chinatown and other parts of the city. There isn’t much eateries around the hotel, there is a Dome cafe on the first floor of the hotel and some other restaurant that are part of the hotel. To taste local food, one would have to venture out of the hotel. We were assigned the Terrace Suite, which is large and has a contemporary design. There are 4 sections to the Terrace Suite. The corridor from the door into the living was spacious. It is minimalistically decorated with a single painting, making this area feel rather empty. The Further into the corridor from the entrance to the suite, a work desk is tucked by the wall in the corner of the living room. There is a USB port and a direct HDMI port at the work desk that allows occupants to plug their laptop to the TV directly. There is only 1 power socket at the work desk, guests can plug out the desk lamp located below the work desk should one need more than 1 power socket. Beside the work desk is where one would find the mini bar, placed inside part of the wall to the suite. 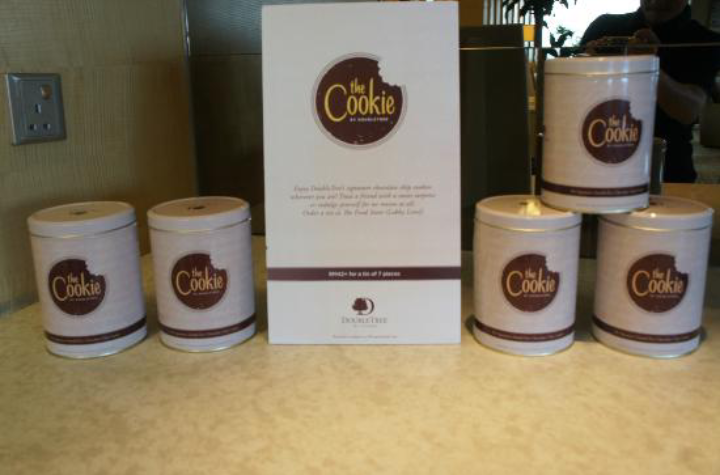 DoubleTree by Hilton provides guests with 2 espresso capcules to be used on the espresso machine in the mini bar area. There is only one power socket here, which can be a tad inconvienent for guests of the suite. This means guests would have to alternate the use of the espresso machine and the electric flask that is also placed beside the espresso machine. Further into the living room, one can find a beige colour 3 seater sofa and a coffee table placed at the other corner of the living room. The 42″ LED TV seem to be off centred at first glance, the TV is actually mounted on a rack that allows it to be swung to face either the work desk or the couch. Facing the couch and beside the TV mounted on the wall of the living room, a door opens up to the bedroom of the Terrace Suite. A bulk of the bedroom space is taken up by the King-size bed, which is placed in the centre of the bedroom. The sleep quality on this bed is excellent, the mattress is of the right firmness and the pillow is not too soft. There are a couple of bedside tables beside the King bed. An armchair sits in one corner of the bedroom by the window. There is another 42″ LED TV in the bedroom, however unlike the one in the living room, the TV in the bedroom cannot be swung. Next to the door to the bathroom is where the wardrobe is located. The wardrobe is fairly large and has no lack of space for guests to put away their clothing. The in-room safe is found inside the wardrobe. Between the wardrobe and the door to the bathroom is a ledge where guests can put their luggage on. Access to the bathroom is only via the bedroom. The marble bathroom is quite large. 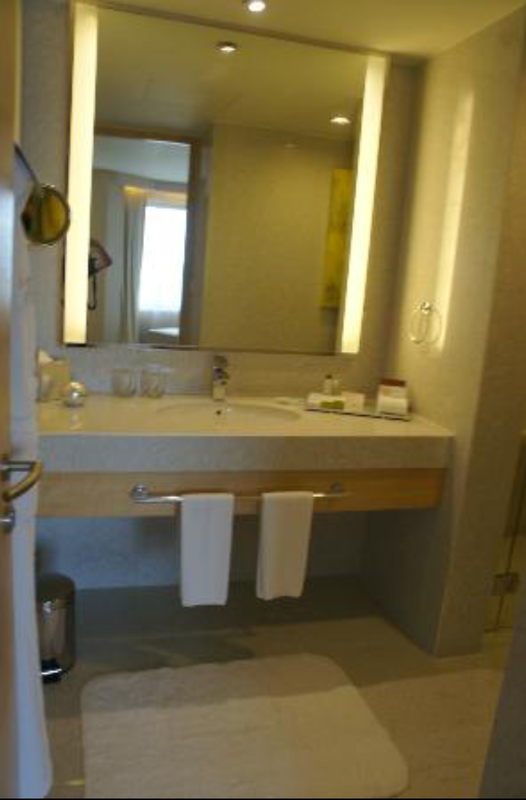 From the entrance to the bathroom, one can find the sink area with ample spaces to stow one’s additional toiletries. Further into the bathroom, one can find the wet area enclosed by a glass panel. This area is where the bathtub is located, furthest into the wet area, while the space between the bathtub and the glass wall is where the walk-in shower is located. This placement allows one to shower after take a soak in the tub, without wetting the bathroom too much. Beside the glass wall, in the furthest corner of the bathroom is where the toilet bowl is located. Entrance to the terrace is via a door in the living room, between the couch and the work desk. The Terrace is a large outdoor area furnished with a couch and a couple of arm chairs. 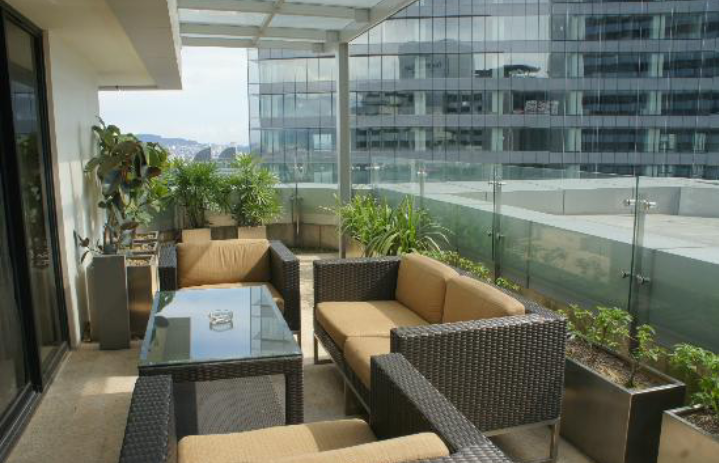 The terrace faces the Petronas Twin Tower, and makes it a great place to hang out. The side that is facing the road is very windy and one can hardly hear any traffic. The view from the terrace is just stunting. 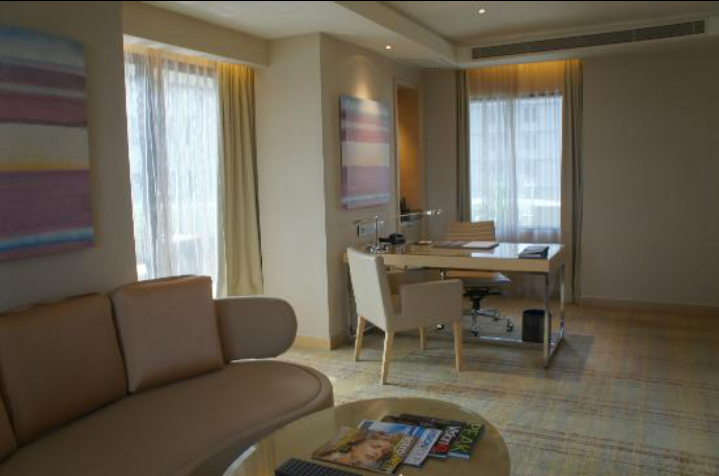 The Executive loungeis located on the 34th floor of the hotel and is a fantastic place to rest and recharge. 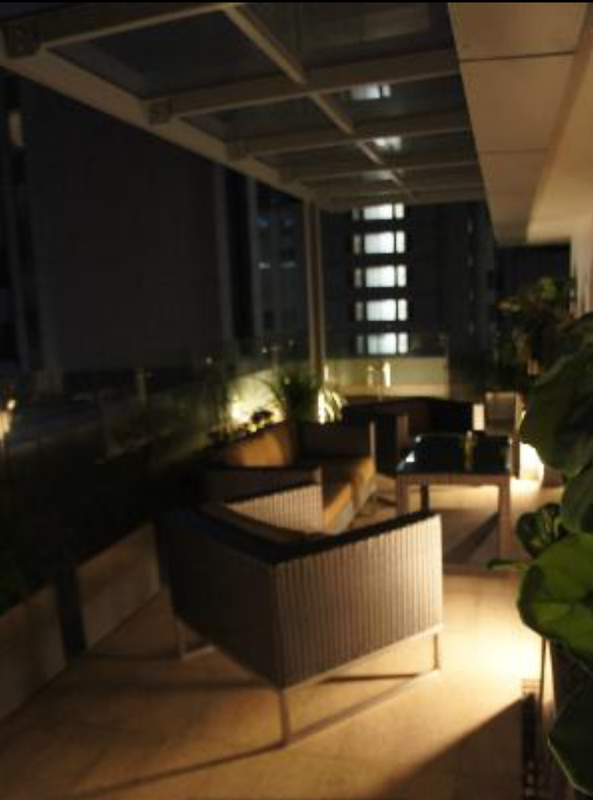 The quiet lounge is large and has a terrace that faces the Petronas Twin Towers. Staffs at the lounge are very friendly and welcoming, never stingy with smiles and checking out how one’s day was. They are also full of suggestions that gives guests valuable tips on what to see and where to go in the city. 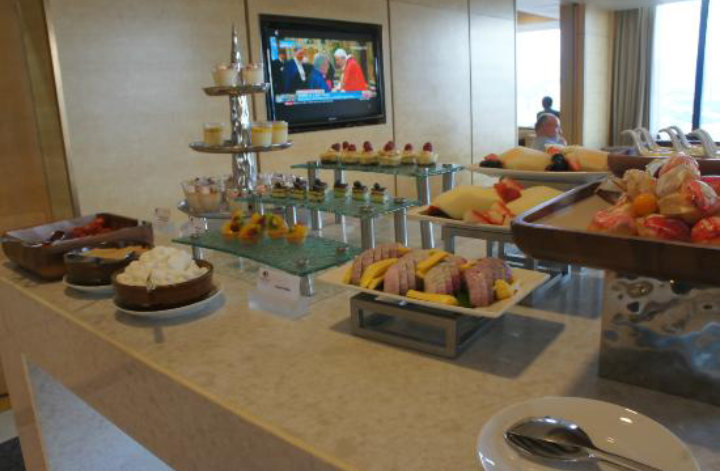 The lounge serves snacks all time and during afternoon and evening, addtional finger food will be served in the lounge. Guests staying in the Terrace Suite can choose to check-in and check-out at the Executive lounge. 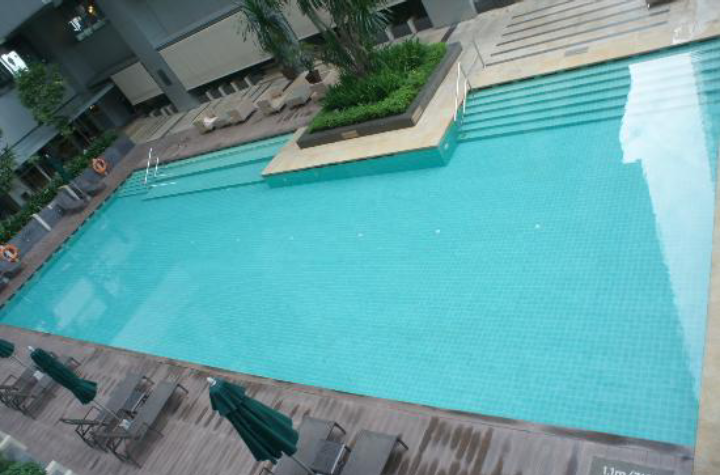 There is a salt water pool located on 10th floor in DoubleTree by Hilton Kuala Lumpur. Other than the main pool, Jacuzzi and a small pool by the side for kids can also be found here. If one were to suntan here, one would be disappointed as the placement of the pool does not permit direct sunlight to enter the “valley” where the swimming pool is located. There is also a small gym next to the pool. 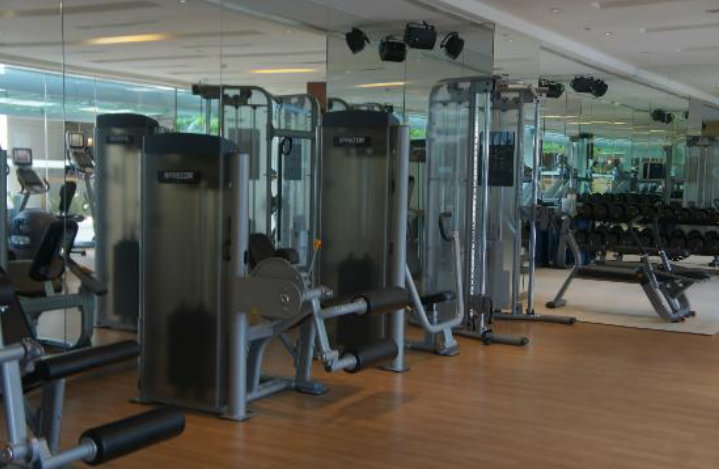 The equipment of the gym is rather limited and feels boring. First impression of the hotel was excellent. From the porter at the door of the hotel, who approached me as I was alighting the cab from airport, offering to help with my luggage to the check in staff at the lobby who checked us in with a smile and offering the signature cookies that they offered to all guests checking in. I was initially being assisted by Abigail and her colleagues, whom after offering me the cookies told us that she will be expecting me at the Executive Floor Lounge after I checked in. However the service standards went down hill as I was waiting for my room. As I opted for the eStandby Upgrading offered by the hotel, which gave guests an option to upgrade room at a discounted rate. I opted for either the deluxe suite or the Executive Suite. During check in I was confirmed with the executive suite was available for me and was told that the hotel needed another 5 to 10 mins for the housekeeping to get the suite ready. My wait extended from 5 to 10 mins to 3 hours! Being hungry and tired, I told the staff at the check in lobby that I will be going for our lunch and be back later. I managed to get our room after our bite, and confirmed to the staff if I have gotten the Executive Suite, but the staff was muffled in his reply. When asked if there are any lounge access with our room, all I was told was that our room is on the highest level of the hotel but I would have to pay extra for the lounge access. Thinking that I was assigned the Executive Suite, having no access to the lounge was not much of a big deal. However upon entering the room was assigned, I was shocked to learnt of the room that was assigned was the normal deluxe room. I was rather irritated by the fact that the staff did promised Executive suite at the point of check in and made me waited for 3 hours, end up I got the deluxe room instead. To be frank I felt rather cheated at this point and went to the Executive lounge to get the room issue resolved, after failing to get anyone on the Careline that the hotel has. At the Lounge, another staff by the name of Khalid, listened to my ranting with empathy and was shocked of the situation that we were in. He quickly worked to resolve the issue and found a deluxe suite for us, on top of that he offered late check out. However my outbound flight schedule does not permit for the late check out. Instead of leaving it as that, I was informed that Khalid will be making special arrangement for me and invited me to the lounge for refreshment, while he get the housekeeping to get ready my suite. At this point I saw Abigail at the lounge and she learnt of our situation and apologised for the foul up. Abigail wanted to take full responsibility of the foul up, however I explained it was not her fault. Despite that she still took responsibility of the situation, and quickly checked with Khalid of the status of my room. After 10 mins, both Khalid and Abigail approached me and told me they explained my situation their duty manager. The duty manager agreed to upgrade me to the Terrace Suite at the price of the upgrade to deluxe suite! I was surprised at the commitment by both Khalid and Abigail had displayed to salvage the situation. The service recovery displayed by both staffs was timely and excellent. I had an enjoyable stay at DoubleTree by Hilton Kuala Lumpur. The staffs were caring and observant and made me felt welcome. The service recovery was excellent and staffs such as Abigail and Khalid took it upon themselves to ensure that I was well taken care off during my stay with them. The suite was spacious and nothing short of excellence, the views from the terrace was fantastic and the sleep quality on the bed is great.